Ten barriers that block the adoption of technology, five strategies to this issue, and how the adoption of technology will help get legal aid to those that need it. The legal industry has always been the last to catch up with innovation. Technology, however, may help with one of the industry’s biggest problems, access to justice. 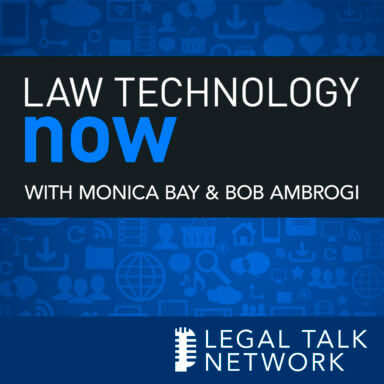 In this episode of Law Technology Now, host Monica Bay talks to James Sandman about the ten barriers he sees that block the adoption of technology, five strategies to this issue, and how the adoption of technology will help get legal aid to those that need it. He also talks about the Trump Administration’s budget plan which aims to cut the Legal Services Corporation funding. James Sandman has been president of the Legal Services Corporation since 2011. Monica Bay: Hi. I am Monica Bay and you are listening to Law Technology now and I am delighted to have a wonderful guest today, James Jim Sandman, who is President of the Legal Services Corporation. And I am absolutely delighted to have you again Jim, because this is your second time on Law Technology Now and you are the first person to have a second time on it. So I am delighted to have you. James Sandman: Thank you Monica. Monica Bay: It’s my pleasure. So last week we were in Silicon Valley at Stanford for CodeX’s 5th Annual FutureLaw and that’s a unit of the Law School at Stanford. And you were on an amazing panel that had I think five people and five — it was all doing a thing about the fifth year of CodeX’s FutureLaw and you had a fantastic panel, and I loved what you said, and I am going to basically turn it over to you and I would love to have you talk about what’s going on right now at LSC. The mic is yours. James Sandman: Thank you Monica. It’s great to be back with you. I spoke last week at CodeX as a follow-up to the keynote address that I gave last year, where I identified 10 barriers to the adoption of technology and then proposed ten agents of change or levers of power that might be invoked to accelerate the adoption of technology in law, and this year what I did was to pick five things to focus on going forward, what are the five fastest routes to get to broader adoption of technology in law. My premise is that when it comes to the use of technology to serve our customers, law is a laggard and not a leader. The problem I believe is not a lack of innovation, there’s plenty of that, I think it’s a lack of adoption at scale, large scale adoption of technology to improve the delivery of legal services. To me the practice of law today, in the 18th year of the 21st century looks pretty much like it looked to me in the 20th century, and although I wasn’t around then, it looks in some respects like it was in the 19th century. I came across an example recently that I think illustrates the reality of our legal system today, particularly for low income people who can’t afford a lawyer, that’s the population I am concerned about here at the Legal Services Corporation. The Legal Services Corporation is the country’s largest funder of civil legal aid programs for low income people. We do a lot to promote the adoption of technology to serve low income people, but despite our best efforts they still face a number of big hurdles, because the system they are dealing with is so behind the times. When you file for divorce in Kentucky, you must file a VS-300 form with the court clerk. While all other self-help forms may be submitted with hand-written entries, the VS-300 must be typed. You must complete the form online at this link, and there’s a link to the form. You must print this document on 25% Cotton Bond Paper with a visible watermark. You can purchase this thick resume-type paper at most office supply and retail department stores. 25% Cotton Bond Paper with a visible watermark, in 2017, that’s a barrier to justice for somebody trying to get a divorce in Kentucky. The price of a ream of cotton bond paper, and you need to buy it in a ream, looks to me to be about $16-30, depending on where you shop. That’s a lot of money for a poor person who is trying to get a self-help divorce. Notwithstanding the technology that we have available to provide information about this process to people on a helpful website, they still face barriers like that. So we need to do a lot to clean up the system and make it more accessible to people who can’t afford a lawyer. So what I would like to do is to summarize five things that I would recommend to try to accelerate change in the practice of law, in the delivery of legal services, and the widespread adoption of technology. Just for review purposes, I will briefly go over the 10 barriers that I identified last year. They are, number one, and it’s number one for a reason, a lawyer administered regulatory system that is too often more protective of lawyers than consumers, is conservative, is slow to act and react and casts a pall of uncertainty over the possibility of change that deters investment. The second barrier is that judicial system that disperses authority and decision making across the court systems of 50 states, plus the federal courts. Third barrier, insufficient capital to support innovation at scale. Fourth, a pricing model, the billable hour that persists notwithstanding claims that it has gone away and that does not reward, but actually penalizes efficiency. Fifth, law firm structures that impede strong management and quick innovation. Management is dispersed among partners in a law firm. Sixth, a malpractice insurance environment that can discourage new processes because insurers rate risk based on experience; if they don’t have experience with something, they may regard it as a risk. Seventh, a legal system that’s based on precedent, which by its nature discourages innovation. Eighth, a system of legal education that provides no broad grounding in management or efficiency or client service or the user focus. Now, there are law school programs today that do provide training and technology, but in my experience they are all electives and they reach only a small fraction of the total of law students. Ninth is a culture in the profession that emphasizes lawyerly judgment and suggests that every case is different, that discourages routinization of legal work. And finally, we need to look at who becomes lawyers. Lawyers as a group are risk averse. They tend not to be entrepreneurial. So where would I look to try to accelerate the pace of change. I think things really need to be speeded up. Well, first, I would look to court allies. The judicial system itself has an incentive in improving efficiency. It’s difficult for judges and for court administrators to run a system where so many people are unrepresented as they are today, who don’t know what they are doing as they try to navigate this legal system that was created largely by lawyers, for lawyers and assumes that everybody has a lawyer. So I tried to enlist help. If I were a technology innovator looking to promote rapid change to the National Center for State Courts and I would look to their related agencies, the Conference of Chief Justices and the Conference of State Court Administrators. The President of the National Center for State Courts is quite innovative. Their Vice President for Research and Technology Tom Clarke is both a visionary and a pragmatist. He has been quoted as saying courts adopting yesterday’s technology tomorrow. I think that reflects kind of a humorous perspective on where things stand and on the need to promote change at a faster pace. Second, I would look to clients to try to mobilize the effort to accelerate adoption of technology. I would probably have to do it through lawyers, that is corporate general counsel, who are in a position to force the law firms that they hire to do business differently. I would look particularly to the Association of Corporate Counsel and the Association of General Counsel. They are the client interface for outside counsel, the in-house corporate lawyers that are active in these associations. They have a keen interest. They have an economic interest in promoting efficiency and they can be helpful in pushing adoption by their outside counsel. Third, notwithstanding what I said about malpractice insurance companies, I think insurance companies that pay the legal bills for their insureds could be powerful allies in promoting more efficient practices and accelerating the adoption of technology, because they have an economic interest in improving efficiency and in reducing costs. If you have got an innovation that if it were adopted by lawyers for insured businesses and would increase their efficiency and reduce their costs, have you talked to the insurers about it? I think they could really help in pushing their insureds and their lawyers in the right direction. So my fourth place to look for help in trying to accelerate technological change in law would be to organizations that rank law firms. Organizations like BTI Consulting or American Lawyer Media. They create what some refer to as league tables that rank law firms on a variety of different subjects. They ask clients to rate the law firms that they use. Well, what if they were to rate law firms on their use of technology? What if they were to ask the clients of firms to rate the firms that they use on their use of technology? That kind of information put out there transparently would get the attention of big law firms, which are often the first to adopt at scale and which can have an effect across the entirety of the legal profession over time. So shine a spotlight on who is doing a good job and maybe who is not doing a good job. That will get attention. And finally, I suggest that people think about enlisting help from State Attorneys General and from State Legislators if they think there are consumer protection problems in the failure of the legal profession through its own regulatory system to adopt change fast enough. If the resistance of the legal profession to change that really should benefit clients is slowing things down. Well, there are others that are interested in that issue and are capable of dealing with it and have the power to deal with it. Those are State Legislators and State Attorneys General who could take action and be excellent allies under the circumstances. So these entities, the five that I mentioned, can all help drive transformational change. They can help pick up the pace. My bottom line is this. We need to think outside the usual bubble. We have to get away from lawyers talking to lawyers and techie lawyers talking to techie lawyers and think who can we enlist as allies, who can we build bridges to, who have access to power or are power themselves and can help us get where we need to get to serve our clients. Monica Bay: James, it’s just so exciting to listen to what you are saying and it’s so important for everyone. I really appreciate your time on this, but I am not letting you go quite yet. So when we were at Stanford you were asked about with the change of the administration, are you still getting the funds that you need to do your work? James Sandman: We are currently, but the President has proposed in his budget for the next fiscal year, which will start on October 1st, that funding for the Legal Services Corporation be eliminated. I don’t believe that that’s going to happen. I think that Congress is going to continue to fund us. I believe that for a number of reasons. Congress has funded us through Republican and Democratic Congresses for 42 years now. In each of the last three fiscal years our funding went up by $10 million each year, even though there was a very tight budget environment. I think that’s a reflection of bipartisan support. We have heard from a number of members of Congress that they intend to continue to support us. They understand that the work we do for constituents back in their home districts, the help that we give to veterans seeking benefits, to survivors of disaster who need the assistance of a legal aid lawyer to get back on their feet. The work we do for seniors who are fighting off consumer scams, the work we do for victims of domestic violence and getting protection orders against their abusers. And they also understand that what the Legal Services Corporation is all about is the most fundamental of American values, justice for all, equal justice under law. This is what America is about. We are as American as apple pie and as the Fourth of July I would like to say. We have also seen an outpouring of support from across the country for the work that we do. The Conference of Chief Justices and the Conference of State Court Administrators have written to Congress emphasizing the importance of what we do. More than 185 Corporate General Counsel have written a letter emphasizing the importance to the rule of law of the work that civil legal aid lawyers funded by LSC do. The leaders of more than 160 law firms from all 50 states have written about the importance of the work of legal aid and about how well-funded legal aid organizations are critical to their ability to do pro bono work, because they need the infrastructure and the expertise of legal aid organizations to help them do the pro bono work that they take on. More than 160 law school deans have written, state and local bar associations across the country have issued statements in support. There have been op-eds and editorials. The American Bar Association has been very active. It’s been nice to see that people appreciate the good work that we want to do and want to see it continue. Monica Bay: Well, I know so many people appreciate what you are doing, and I also understand there is a group called HYPERLINK “http://www.defendlegalaid.org” defendlegalaid.org that you might want to check out. And most local areas are very active on this, and local bar association, so I encourage everyone to be involved on this, because it’s just so crucial. I keep repeating over and over and over again one of the statistics Jim that you came up, which I use almost every time I speak, which is that 80% of Americans can neither find a lawyer, nor afford a lawyer and there’s just so much to be done, so I encourage you to do all of that. We are running out of time. So Jim, I want to give you a last voice here, is there anything else that you want to share with us about what’s coming up in the near future and where you think we are going? James Sandman: Well, I just want to emphasize the importance of legal aid for people who can’t afford a lawyer. It’s necessary to make our country’s promise of justice for all real to people for whom that would otherwise just be a cruel illusion. There are cases in courthouses across our country everyday where people are forced to navigate the system on their own, and the stakes can be very high. You can be talking about the roof over their heads, keeping their families together, and they confront a system created largely by lawyers, for lawyers, and based on the assumption that you have a lawyer. Works pretty well if you do and not well at all if you don’t. We owe it to those people to make the system easier to navigate. And I think that technology has a big role to play in making information more accessible to people so that if they do have to appear in court without a lawyer, they can do it competently and with confidence that they are going to get a just result. Monica Bay: Well, I am delighted to have you come for the second time. And one final question, if someone wanted to reach out to you, how could they do that? James Sandman: Well, I am going to give you my personal email address and my phone number. I talk to anybody who would like to talk to me. My email address is HYPERLINK “[email protected]” [email protected]. My phone number is 202-295-1515. That’s my direct line. I answer my own phone. I would be happy to speak to anyone who wants to speak to me. Monica Bay: Well, I totally thank you again, and as I said, I hope I will have you many, many times on this show. I really appreciate what you do and I know many, many, many people admire you as much as I do. I am Monica Bay and thank you for listening to Law Technology Now. Outro: If you would like more information about what you have heard today, please visit HYPERLINK “http://www.legaltalknetwork.com/”legaltalknetwork.com, subscribe via iTunes and RSS, find us on Twitter and Facebook, or download our free Legal Talk Network App in Google Play and iTunes.